Love mascot design. As its not a regular feature on the ol' pricelist I haven't done any official character/ mascot design in a while. So this was a LOT of fun. 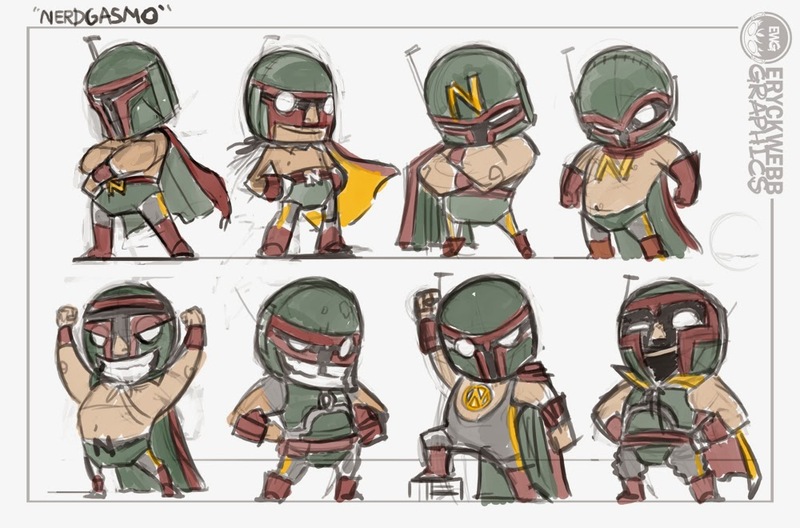 Working on a new Mascot and logo for nerdgasm.net - heres 8 preliminary explorations of combining a 'EWG Dewd' style chibi character with 1 part boba-fett and one part lucha libre! I tell ya, the design of fett's helmet and the general look of lucha libre wrestlers goes together quite well. So here I played with body proportions, arrangements of facial features versus the design of boba-fetts mask and encorporating boba-fetts costume colors/ segments into wrestling uniforms. This is first round of idea variations, and could lead to any mix match and changes of sorts. Nothing here is final by any means. But I think its off to a strong start! References were boba-fett pictures, lucha libre pictures, mucha lucha cartoons and various studies of chibi art and other cartoons.